My entire life, when considering what to do with potatoes, my mind has gone straight to french fries.. Mashed potatoes seemed both too much work on the wrist and too gooey to be a dish. Now I know I’m going to be discriminated of all mashed-potatoes-lovers out there, but yes, I was the kid who rejected mashed potatoes at family reunions and embarrassed her mother. Now that I’m a fully-grown, independent woman, I know better than to just stick to the basics. It’s wonderful how you can learn new things everyday online. It helped me get my scalloped potatoes right, and I hope this version could make your day! In case you hadn’t noticed, lots of dishes could be altered significantly with just a slight twist in ingredients. In our case, a Français de la patate. “Gratin” refers to dishes with sliced veggies arranged similarly to “Ratatouille”, if you’re familiar with the cartoon, baked with a kind of topping (pastry, cheese, breadcrumbs etc.) spreaded on top. “Au” as in “Omelette au Fromage” – Cheese Omelette, which, simply viewed, has a similar meaning to “the” in English, although in fact it has a linguistically complex meaning. The full name “Potatoes au Gratin”, simply put, is potatoes done “Ratatouille style”. How do French chefs pull off a “Potato au Gratin”? First, they use a mandoline to thinly slice the potatoes with the skin on. Thin slices can be arranged more beautifully, cooked more evenly and look more intricate on plate. Then, after being layered over one another to fully occupy the bottom of the baking dish, they are dolloped with cream and cheese on top and put into the oven. The butter’s presence is only to grease the baking dish, and is not intended for seasoning the dish whatsoever. 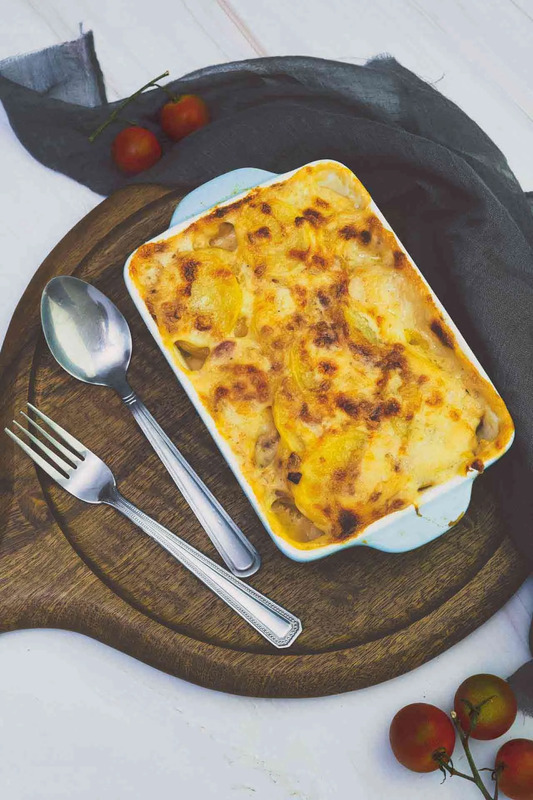 Scalloped Potatoes are a bit different to this seemingly cheesy “Gratin”. The slices are doused in a thick sauce made of butter and diced onions, with flour as a thickening agent, which makes it considerably more fragrant than the other dish with plain cream and cheese. Finally, we sprinkle this heavenly baked dish with some grated cheese just for a hint of umami and creaminess, which has a much greater effect than you might initially expect. Usually, we don’t need to pre-cook anything when it comes to baking dishes. The purpose of baking is to slowly tenderize whatever filling it contains, and with just a bit of moisture, everything gets to be cooked evenly. To that end, there is no need to pre-boil the potatoes before slicing. However, if your slices are too thick, it is also possible to boil the potato slices in milk before actually baking them. Why milk you ask? The secret lies within the words “thinly sliced”. The thinner the slices are, the creamier they become as they absorb milk during the baking process. Now that they are thicker than expected, simmering them in milk partly helps them absorb more milk. Using water would only cook them through without further seasoning. Bring a pot of milk to a simmer, then add in the potatoes and cover for 3 minutes maximum. Drain the potatoes with a clean bowl at the bottom to reserve the milk as we will re-use it for our sauce later on. All you have to do now is follow the recipe, without fear of your potatoes not being properly cooked through. Want to have this for breakfast on a busy day? No problems at all! Make this ahead of time and you could either freeze it and reheat it in the oven for a quick breakfast the day after, or refrigerate only the ingredients for a quick yet delicious dinner that night. Sliced potatoes are best kept when submerged in water, as they help prevent the slices from oxidizing and turning brown. Although they are best kept overnight, I’m sure you’ll agree it’s far better to have a freshly baked dish made from ingredients kept overnight than a pre-made meal which has been reheated, right?? Preheat the oven to 350°F and grease a casserole dish with butter or cooking spray. Melt 3 tablespoons butter over medium heat in a saucepan. Sautée onions in butter for about 2 minutes or until tender. Stir in flour, salt and pepper and cook until everything thickens and bubbles. Remove from heat and stir in milk. Bring to a boil and stir constantly for 1 minute. Arrange the potato slices in the casserole dish and pour the sauce over. Slice the remaining 1 tablespoon butter and place on top. Cover with tin foil and bake for 30 minutes. Uncover and bake for another 1 hour to 1 hour 10 minutes. Let stand 5 to 10 minutes before serving (allowing the sauce to thicken). YUM! This looks so rich and creamy and beyond comforting — perfect for this cool weather. I love it! I was stunned too! What a great creamy combination that lingers for days :P.